Released in September, 2010, Works & Days, has garnered unusual critical attention for a first book. 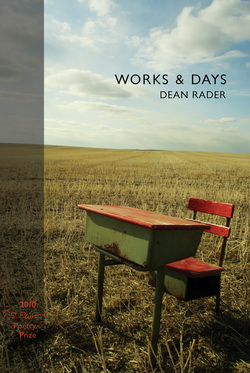 Known for his book reviews and op-ed pieces as well as for his scholarly work in the areas of American Indian studies and visual and popular culture, Dean Rader has produced a debut collection that is an ambitious and funny series of poems that judge Claudia Keelan has described as "a primer for MFA programs everywhere." Divided into three sections--"Works," "&," and "Days"--Rader's poems map the intersecting roads of the personal and the cultural. The first section, "Works," contains poems about works that shape how the author sees the world, like the poetry of Wallace Stevens, popular music, the art of Robert Motherwell, the mysteries of Havana, Hesiod's ruminations on duty and the divine, and Frog and Toad. "&" is a more playful experimental section that connects the themes of "Works" (poems about Michael Jackson, pumpkins, Dorothea Lange, and Frog and Toad) with the autobiographical final section. "Days" begins with the poet's 30th birthday and marks each subsequent birthday until his 41st, which loops back to the path of "Works" with a final closing poem inspired by the Estonian composer Arvo Part (and, of course, Frog and Toad). The sky is big in Oklahoma, but, of course, it extends further than one imagines. Thus Dean Rader’s mind in Works & Days, which begins in Rader’s native Oklahoma and moves ever onward and backward and outward in a trekking meditation on where we are (moving forward), what we are (the traveler but also the logos), what we’ve been, where we’re headed. Are we Wallace Stevens in the grave dissipating into the world’s system? Or are we Whitman admiring the long hair of graves? Are we the dust bowl farmer? Or Hesiod logging the worker’s long journey toward death? Are we the Native shaman or the old couple on the airplane? Are we Frog or are we Toad? Dallas or Delhi? The corrido or the poem of experimental form. Yes. And yes. They all and more are here, and so we become; and “all transformation is addition”. It’s hard to say what I love most in this glorious debut volume; is it the glorious Frog & Toad poems, the love poems, or the one-on ones with mentors—Stevens, Pound, and Wright? What’s clear is that re-reading only intensifies the delight of Dean Rader’s Works & Days. There’s something reminiscent of John Donne in Rader’s poems, the earnest spiritual questing of the sonnets and sermons counterbalanced with delightful and unexpected wit. Contemplate the marriage of “Batter my heart” with the playful “Mark but this flea…” and you’ll get a sense of his range. Dean Rader’s book is full of vast expanses. The title is taken directly from Hesiod (a bold reference for a debut collection). The original was a key work of classical literature: a farmers’ almanac instructing the writer’s brother on how to work the land in the midst of a farming crisis. Rader comes from a different place and time: born and raised in Oklahoma, he is now professor of English at the University of San Francisco. But there’s a convincing sense of a connection across the centuries: both writers share a concern with land, labour and language . . . One of the reasons the voice feels so confident in this collection is that you feel the poet is in command of the effects he achieves, which is not something you can say about everyone. The first challenge for any poet is to find a poetic register in which they can express themselves fully and naturally, and Dean Rader has found his. Works & Days is an engaging book that manages to be both experimental and “accessible,” if by that latter term one doesn’t mean dumbed-down. More than just a conglomeration of poems, it is a book with a subtle architecture, an ironic unity fashioned on the theme of fragmentation. This coherence and sophistication is an outstanding achievement in a first book. In [an] impressive debut, Works & Days, Dean Rader, a San Francisco writer and professor, serves up a feast of styles and subjects. The title is borrowed (inherited?) from Hesiod; thus the book includes "Hesiod in Oklahoma, 1934" and "Self-Portrait: Hesiod in Iraq." There's also a Hesiod epigraph, but considering the oblique Self Portraits, not to mention the amusing appropriation of Frog and Toad from Arnold Lobel's children's stories, Kathy Steele's epigraph seems most apt: "The self is not continuous" . . .[an] enjoyably clever book. I find particularly appealing Rader’s preoccupations with language, God, and desire—and what I liked most about this book is that it managed to explore these themes and incorporate a delightful sense of absurdity and humor. As I read these poems on the train, I often found myself smiling to myself, even laughing—and maybe the other passengers thought that was a little odd, but isn’t it beautiful to enjoy a book in that way? . . . He manages to create poems that are perceptive and contemplative while also being fun, and this is the sort of balance many of us strive for—both in literature and in life. Oh, golly, what a bunch of fun Dean Rader's Works & Days is. To come upon such a book that makes me think, laugh, feel, and hear language anew! Where to begin? . . . As I was reading the book, I kept thinking of Lucretius' exhortion to his goddess, the he be able to deliver his facts in honeyed words: poetry doesn't get much better than when narration and music, reality and imagination, seriousness and giddiness all hook up. . . . He uses most of the poet's toolkit--the ancient art of repetition, call and response two-liners, Anglo-Saxon alliteration, dashes, italics, ellipses, and brackets--and when those do not prove to be enough, he invents some new tools for doing what he wants in order to make us see poems afresh . . . Rader is a model of a madman freedom that has been persuasively bent to the craftsman's bridle.